It doesn't slice very neatly, the crust fractures easily, and the filling eventually becomes a soupy glop on the plate. Yet it is somehow comforting. Pie is familiar, flexible and always ready to adapt. Just like a big, sloppy, wet kiss, pie emanates home, hearth and love. Winter weather has arrived in New York and a frosty wind pummels me as I hurry along Lexington Avenue. The Dow has done another one of its late afternoon nose dives, I’ve got a strange and feverish buzz from the flu shot I received earlier in the day and its god-awful cold. 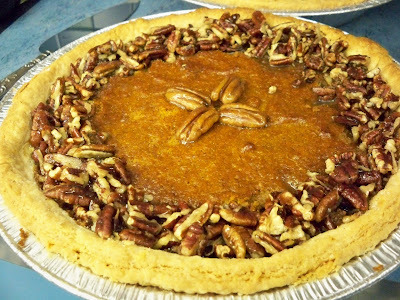 It’s the perfect night for a comforting piece of pie. Maybe two. Maybe even three. I enter a large classroom painted in primary colors and adorned with works of finger painting art in the basement of the 92nd Street Y. There, author and food historian Francine Segan is setting a groaning board of nearly a dozen, picture-perfect pies. Francine has one of the best jobs in the world. She researches and recreates historic recipes, and has authored several stunningly photographed cookbooks. She cooks with the Today Show Family, interviews Jacques Pepin and hosts lectures focused on the kinds of foods most of us obsess over. 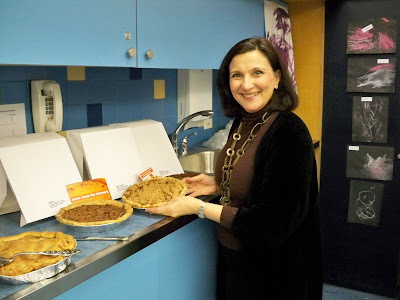 Tonight, she’s serving up a lip-smacking program on the history of pie. Frankly, the group of guests looks a bit beleaguered, but things are about to brighten up, as Francine invites us to help ourselves to a little pie. The momentary commotion at the pie counter resembles a Blue Light Special at K-Mart. “If you’re allergic to anything, you’re out of luck,” says Francine. “There’s nuts, there’s fruit and there’s plenty of sugar.” Within minutes we are back at the table, each digging into a plateful of pie. The mountainous plate before the woman across from me looks like a three-dimensional work of abstract expressionism. Wayne Thiebaud, eat your heart out. There are eight choices, and I can proudly say I sample almost all of them, including Honey Pumpkin Pie, Banana Cream Pie, Medieval Meat Pie, and the ever-popular Mock Apple Pie. Pie for dinner you ask?? Don’t raise your eyebrows at me. You’d do it too, in a second. 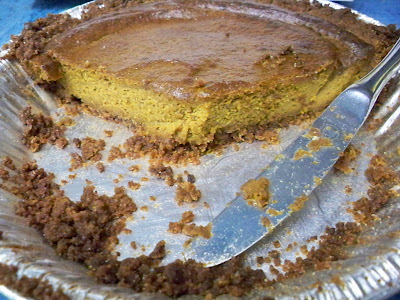 It proves to be a balanced meal indeed – the Pumpkin Pie chocked full of beta carotene, the banana cream pie a good source of potassium, and the savory meat pie providing a full-serving of protein. Not to mention all that love. The first recorded recipe for pie comes from Roman times and was a Rye-crusted Goat Cheese and Honey Pie. As Francine describes it, in the Elizabethan era “pie was kind of like a Tupperware container where you put your leftovers,” resulting in all kinds of varieties of meat pies. The Lemon Meringue Pie was invented by a woman from Philadelphia named Elizabeth Goodfellow. Pie a la Mode was made famous on the menu at the famous Delmonico’s Restaurant in New York, but was actually invented by a professor from Cambridge, New York who liked to combine pie with ice cream. The Eskimo Pie, invented in the 1920s, borrowed the name. It is not a pie. Likewise, Prohibition seemed to have inspired the invention of a variety of sweets (we will satisfy our addictions, somehow). 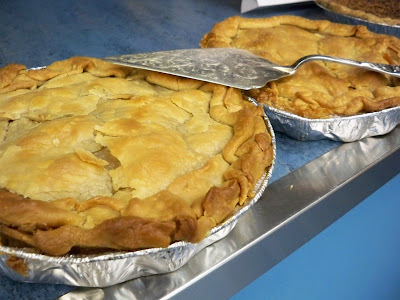 Mock Apple Pie was invented in the 1930s as an economic alternative to the genuine article, when crackers were free, but an apple cost a penny. When the good times returned in the 1950s and smart suburbanites turned to home entertaining, the cocktail hour, inspired “Cocktail Pies,” like Grasshopper Pie and Brandy Alexander Pie. As you might guess, the classic pie-in-the-face is a distinctively American invention. As Francine wraps up her lecture, she notices that a group of staff members from the Y are standing outside the door and looking in, longingly. Are they drooling? She invites them in to partake of some pie. Francine is a crucial part of the 92nd Street Y employee retention program. Meanwhile, I’m in Pie Paradise. It’s a bit like Hog Heaven, but a whole lot sweeter. 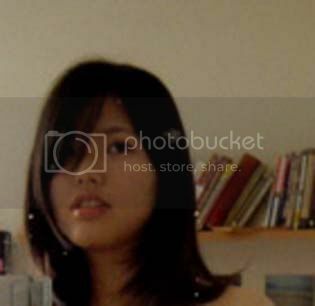 I'm getting full just looking at the photos and reading this post! The class looks like such fun and, you're right, it's the perfect antidote to the stresses of these times. ha! Don't think I didn't pick up on that publishing project you oh so casually dropped in the middle of your post. Now I am looking forward to that! 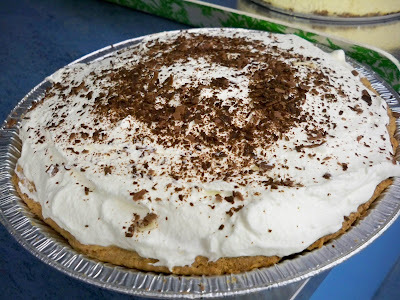 Ah, pie..takes me back to my childhood, when we would drive hours for a mile-high slice of butterscotch meringue at Pete and Piggy's Pie Place, somewhere in the mountains of Western Pennsylvania. I can still see that wooden billboard of a 25 foot pink pig balancing a skyscraper of pies in its little piggy feet. YES!!! This looks so wonderful. And it makes me truly miss the 92nd Street Y. I used to live on 102 and Lex and went to their lectures / etc all the time! And don't even get me started on the pies. And the coincidence! Turns out, my parents' neighbors in NJ are friends of Francine's! Droolworthy...but when were pies ever not the latest big thing??? Pie for dinner? YES PLEASE. No mincing words here, T.W. 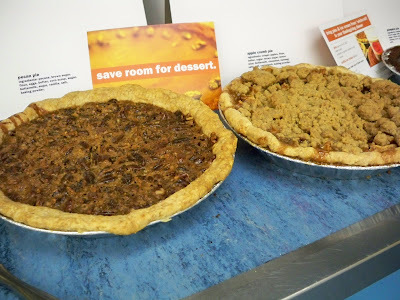 Now you know I must save this morsel of a post for pie day in January! You are one lucky man! Thanks for sharing a taste of history. BTW: I left 5 inches of snow in PA. This weather is summer to me! Pie oh my - I'm inspired and already feeling full from reading about your pie-eating adventures. And with White Castle "catering" my value-centric Chrsitmas party, I just might have to make that mock apple pie, in keeping with my theme! Lydia, one could be quite full attending Francine's lectures. Veron, I would love to see those tiny pies! Hal2008 - Pete and Piggy's sounds like my kind of place. Is it still there? Can we do a road trip?? Cakespy - excellent! This sounds like 6 slices of pie separation! Maryann - I can't get that song out of my head now. Freya - I'm with you. Jesse - Pie is in for 2009. Louise - I can't wait to see what you do with Pie Day. I'll bake! Liz - I want to try your mock apple pie! Remember to only use the freshest Ritz crackers! That's a might fine collection of homely pies, and enjoyable read too! I think hers is definitely in the "top 10 best jobs" list. There is something so homey and comforting about pies, and you've captured it here. A Small Publishing Milestone for T.W.